With stagnant or shrinking budgets what should Facilities Directors do to make the most of their department resources? American School and University Magazine cites Planned Maintenance as one of the best ways to maximize shrinking budgets. SMA founder and PM Implementation guru, Mike Stapleton says that within a year of implementation, a strong Planned Maintenance program will have an economic impact by decreasing energy consumption, overtime costs, and contracted services. SchoolDude recently completed a 5 year study that supports AS&U and Stapleton’s assertions of the value of PM. 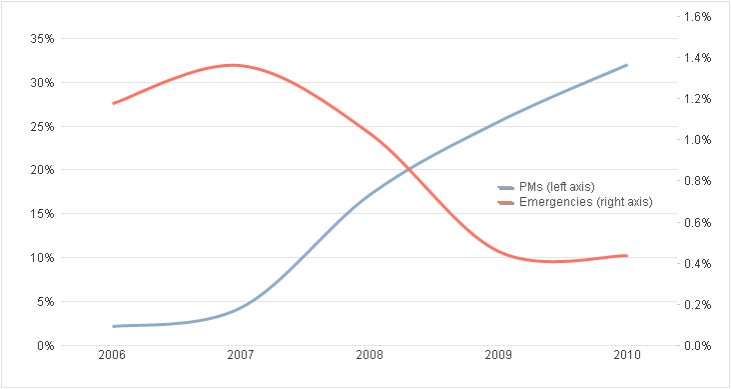 In the study we saw the rate of emergencies fell by almost 60% PM for organizations that make PM a priority. Take small steps: A comprehensive PM program should include detailed task descriptions, reference high dollar assets, and include part descriptions. But remember, those details can be added over time. The most important thing about a PM program is to just start scheduling and documenting it, one system at a time. Start with what’s most important to you- are you concerned about potential litigation issues with playground equipment? Do you know there’s a lot of room for efficiency gains in your mechanical equipment? Dedicate one hour a week to your highest priority needs, and create PM schedules that include the system name (classification), location description, work order assignment, recurrence frequency, and a descriptive name that includes what, where, and when PM is performed (HVAC/Logan Building/Quarterly). Create a culture of PM: This doesn’t happen overnight, but with the right leadership and vision, any institution can create a culture of PM within their department. What exactly does this mean? Make PM work more visible by running reports and sharing with stakeholders and other departments. Make PM a point of pride with your team. Recognize team members for making PM a priority. Extend PM beyond Planned Maintenance to Pro-Active maintenance. Empower your employees to look for opportunities to fix things before they’re reported. One of my favorite success stories is from a district in Colorado that made a Culture of PM a priority over 10 years ago. Now, the staff actually compete with each other to proactively find work to do before it becomes an issue that is reported. More than 50% of their work is Planned Maintenance. Leverage your Resources: Odds are you have a wealth of knowledge in your staff that can help prioritize and document PM. Tap into that knowledge base by asking for input, getting them trained to enter PM schedules. Many folks actually get excited as they see this as an opportunity to leave a legacy for future employees to build on. Get started with planned maintenance today! Check out a Demo of SchoolDude.com's PMDirect!